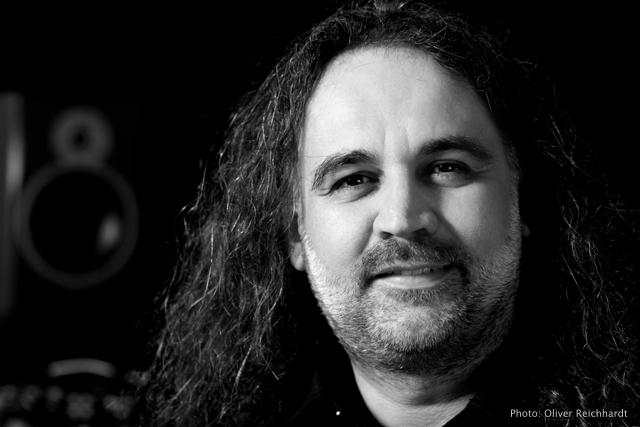 Panos Kolias is a composer, lecturer, producer and musician. When at age ten he found himself showing his accordion teacher how to transcribe songs, he knew he was destined for a life of music. At the age of 16 he landed his first paying job as an accordionist. He soon learned to play several more instruments, and ultimately performed and recorded with many local and touring bands in Greece and Germany throughout the 1990’s – including, with his band, as a support act for ASIA, Steve Lukather and the Los Lobotomies, and Alanna Myles. He started composing music at 16 with pieces for piano and classical guitar and songs with greek lyrics. At age 18, his first theatrical composition was performed. Panos completed private music school study in composition, fugue, counterpoint, and orchestration in Athens, Greece and later went on to study in Germany and the U.S (prof Dan Wyman). His career as a performing musician and his insatiable interest in anything technical helped him to start a career as a live mixing engineer and led on to him becoming the technical director of DOCK’s concert hall in Hamburg, Germany. Deeply involved in the creation of Apple’s GarageBand and Logic Pro, Panos also has unusual depth of technical audio and software knowledge. His recent involvement with Celemony is fulfilling another part of his technical creativity. His depth of technical audio and software knowledge, combined with his classical music education, wide-ranging performance experience, and versatility in genre and instruments, allows him to compose, score, program, record, mix, and produce pieces in several genres from start to finish. Ranging from hard rock to traditional ethnic to classical, Panos’ experience performing and recording with diverse projects over the past 25 years has given him a wide versatility in both performance and composition, with his big love being orchestral music with and without folk, ethnic, and electro elements. He has co-produced two hard rock albums, released an album of Greek lullabies featuring Soprano Maira Milolidaki, and also wrote and produced the scores for short, award winning, films in the 168 hours film project and the 48 hours film project and additional music for the horror film Bangkit Dari Lumpur which aired in Asia and Japan in 2014. Panos is currently contracted with several publishers and regularly produces cues and other commercial music for major television programs like CBS, ABC and others. Besides composing for TV and film and composing concert music, he holds a lecturer position at the Hochschule für Musik und Theater in Hamburg, teaching Music Technology and Film scoring courses. He also works as a musician, educator, orchestrator, and technical consultant. Panos lives in Hamburg, Germany with his wife and their two children, a Bernese mountain-dog, an Iceland pony, and two Norwegian forest-cats.